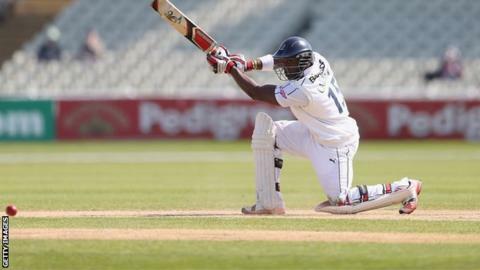 Hampshire batted out a draw on a low-key final day against leaders Middlesex, enlivened only by Michael Carberry's curious half-century. The game ended when the home side declared on 185-5, 236 runs ahead. Carberry managed only 17 off his first 91 balls, with one boundary, but only needed another 20 to reach fifty before being caught off James Franklin for 57. A halt was called soon after Sam Robson dismissed Adam Wheater, only the second first-class victim of his career. Rain delays earlier in the game had helped reduce the chances of a positive result, and a draw became inevitable after Liam Dawson (19) was the only Hampshire batsman dismissed during the morning. Jimmy Adams (37) was adjudged to have gloved a catch off James Harris, the Welsh paceman's 32nd wicket of the season, but Carberry and James Vince (32) then added 59 for the third wicket. England batsman Carberry emerged from his torpor with three successive boundaries off Toby Roland-Jones and later hit a six and four in the same over from Harris as he registered his fifth half century of the summer. He was eventually caught by substitute fielder Nathan Sowter before Middlesex turned to their part-time bowlers to hasten the end. For Robson, however, there was a golden moment in his three-over spell of leg-spin as Wheater (13) edged a catch to the wicketkeeper. "We're pretty happy with how the game went as a whole. We had a good chance to have a decent first-innings lead but we weren't able to follow that through. "Their partnerships yesterday took the fizz out of today which was a shame. "On the whole we played some decent cricket we just didn't take that chance to drive ahead today and declare at some point to give them a tricky period. "Days like today sometimes something happens out of the blue that changes the course of the game but losing the time previously took the time out of the game that could have tipped it one way or the other. "Today was hard work at times especially with the new ball, but then it petered out." "It was a good week's work by both sides and a good draw for both parties. We walk away with 10 points, they walk away with 11. "I'm generally happy with what I saw. I thought we bowled well in the second innings as a group, probably the best we've bowled all year so far. "We were unlucky this morning, they played and missed a lot but they hung in there. But overall, good work all round."